Above left: Guardsmen from C Company, 50th Main Support Battalion (MSB) observe the ceremony welcoming them home in West Orange on May 6. 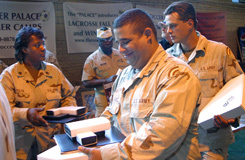 Above right: MSB troops pick up their Freedom Salute packages following their ceremony. Photos by Capt. Jon Powers, 444MPAD. Above: Division Support Command Soldiers pass by an honor guard at the Somerset Armory June 3. 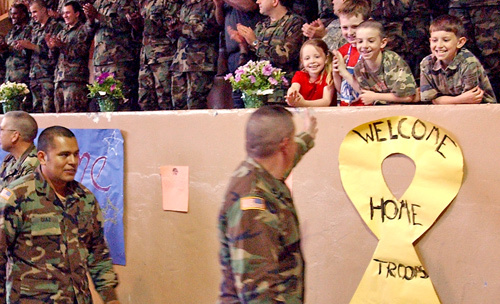 Below: Alyssa, daughter of Lt. Col. Roch Switlick, Commander, 50th MSB, displays a sign she made at the Welcome Home Ceremony in the Teaneck Armory May 6. 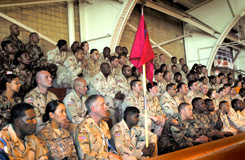 Below left: the Teaneck Armory appears packed to the rafters during the ceremony. Photos by Capt. Jon Powers, 444MPAD. Spc. 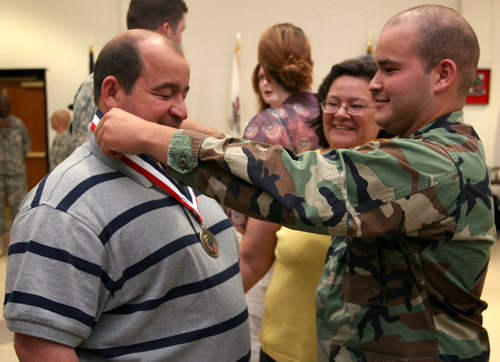 Louis Soto Jr. awards his father a Center of Influence medallion at C Battery's ceremony at Joint Force Headquarters - New Jersey June 19. Photo by Tech Sgt Mark Olsen, NJDMAVA/PA. Above: Governor Jon. S. Corzine (second from left) and Maj. Gen. Glenn K. Rieth welcome home troops from E Company, 50th MSB at the Jersey City Armory May 6. Right: Soldiers listen to speeches praising them for their exceptional service. Photo by Spc. Shawn Morris, 444MPAD.